Night 7497: I love ponies. Everypony. I love them, I think, as a bibliophile loves their collection. Every story, every incident, every bit of conversation is some new story to be savored. I envy these ponies with their lives and their friends, and the stories they make with each other. I would like to be them, to experience them. The big bat guard who smokes cigars and is so masculine without trying. The pegasus guard captain with a ready joke for every occasion. The pony who thinks he's shy but doesn't realize his stuttering conversation is still more than I will ever manage. The diamond dogs (there's several), who are cute rather than ferocious. I wonder about them, were they forced to leave harsher homes for the more accepting lands of ponies? I would like to be everypony, a cripple, a dying man, an alicorn princess, and then come back to write about my thoughts, my emotions, as that person. My thoughts here are primal, I feel myself as the universe must have felt before creation: Nothing.... desperately wishing to be something. But I am not capable of exploding into being with infinite possibilities. I have to live my life, and it is the only one I'll ever have. Day 7498: I can talk for a long time only when it's about something boring. The mailpony delivered a book for me today, one I was excited to have. I tore open the packaging before him, and started to talk excitedly about my book. He stood gamely there for a while, and then forcibly interrupted me to stop my ramble, saying he had to go about his duties. But I looked in his eyes and saw more. "Why are you talking to me? I'm not you're friend. I'm just the only pony you know who doesn't work with you. Am I your only social contact outside of work? Well, I AM working, Ms. Heart, and we're NOT friends, and you're so desperate for somepony to talk to you will engage strangers as you would friends, just to babble on about the latest book you've gotten?" All that spoken from his look to me. And he was right, of course. Sometimes I am desperate to be more than I am. I try and realize that, though. I am not some beautiful mare, not an exciting adventurer, not the lead character. Ponies see one thing, they swoon over it. They see some other thing, they poke it with sticks. Maybe there has to be variety for life to work. Swoon over everything, you get bored. Beat everything with a stick, get bored. Maybe if everything was beautiful, nothing would be. Some of us are boring, so that others of us can shine. Seen that way, my role in life is not unfortunate, it's necessary. Night 7498: Where do you go if you don’t belong anywhere? If I wanted to run away then why come to the city? Because this is the place to hide. This is the place to be invisible. Anyone can be no one here, and I am someone that wants to be no one. Being nobody is not being nothing. It is an absence and not a presence, but it is the emptiness that makes the plenitude possible. It is the hole in the middle that makes a doughnut what it is; it is the empty glass that can hold whatever is poured into it; it is the undifferentiated ocean from which all particular waves arise, last for a while, and then return to their source. Day 7499: When ponies think about loneliness, they often think about something trifling, about a feeling that passes in hours or days. My experience of loneliness isn't like this. It doesn't lift. It lasts for years. As my isolation has persisted, my feelings of loneliness begin to change. I think it's this long-term, intense loneliness that many people don't understand. They don't realize that loneliness can come alive. Without ponies around me, I began to feel as though I were taking up less space. I sometimes felt so ungrounded, so immaterial and unreal, that I thought I might just drift away. There was a relentlessness to my loneliness. It haunted me. But even that doesn't last. In time comes peace, a serenity, an acceptance. If you are immaterial and unreal, you can float. You glide through life, unencumbered by the drama and noise of the world. Fragment from a Letter: I don't think we ever meet someone the first time we encounter them, or even the second or third. It's only after months or years pass that we really meet somepony. It takes that long for the mask to come off, the masks we put on to show the world not who we are, but who we want to be. It's only when we're really comfortable with somepony else that we start to slip, to forget to put on our masks, and let them see us for who we really are. The flaws, the failings, the trepidations and fears and pettiness. I think you only truly meet somepony when you get to see them at their worst. Day 7500: I read this fantastical little story today about a world of sentient wolves, but not just wolves that could speak, not like our magical wolves. No... these wolves existed as collectives. It would take between four to six of them to make a complete "person", as it were. So a "pack" might have a name like "Black-Rak-Scar-Thorn", composed of four wolves named, obviously "Black", "Rak", "Scar" and "Thorn". Only collectively, when they were in close proximity, were they a complete mind. The individual wolves were not mindless, but they were incomplete, we might call them "mentally retarded". But when the pack was together, they were a whole personality. As one can imagine, this came with a number of problems. If the pack was separated and unable to re-group, that personality would be dead. As wolves died and replaced, the essence of who the group personality was would change and morph over time. But, together, they were a person. And, like any people, they warred. In one chapter of the book came a terrible war between two factions of the wolves. Many packs were killed, destroyed, or broken apart. In one scene, a long wolf, having lost the rest of his pack, came up to a pack and whimpered at them, "Can I be part of you?" That scene haunts me. It's devestating it its lonliness, in the need for companionship; not just for emotional comfort, but for necessity to be a complete person. It was so sad to think about that lone wolf, alone, confused, not really complete without others to be close to. "Can I be part of you?" Day 7502: I think there must be some kind of art to having your weekend's free. Mine always seem to wind up so much the same; get groceries, clean house, catch up on sleep, cook food, tend garbage, wash clothing. And of the two days you have off of "work", almost all the hours of those days are spent working. I can't remember if my weekends were always like this, or it's just a consequence of being an adult. I have nostalgia for a time when I was younger and didn't have all those duties and could run out as I wish. Then again, I had these maids called "parents" back then that I do not have now. I really should be in the habit of getting up bright and early on the weekends. Why waste such precious time in bed? I've been thinking about that.... how I "catch up on sleep" during the weekends. But am I really? They say you sleep more when you're depressed, and with no work schedule to stop me, I can sleep in, nap long, sleep again later. Am I recovering from the sleep I didn't get during the week, or just sad, and sleeping my time away. I'm honestly not sure. I'd like to think by now that my sadness is more of a companion than a source of narcolepsy. And that makes me wonder about energy. I see ponies moving around... so vital, so alive, so in the moment. I don't often feel that way. I feel... lethargy, a haze, like a fog of tiredness I am always trying to penetrate. I wonder why I have no vitality, no eagerness for the next moment. Maybe it's diet. The other thing that suffers when your maids called "parents" is gone is that your diet turns to a collection of sugary snacks and fried things. Still, it does feel like I am missing something that puts some zap into my day. In the end.... weekends are a bit like rainbows; they look good from a distance but disappear when you get up close to them. 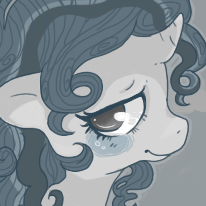 Fragment From a Letter: I think the biggest mistake some ponies make is to think that ponies like me NEED help. Do I really need help? Or do you just think I do? You're telling me what I need to be more like you, to be more like most ponies. But I don't need direction, or momentum. Those are things you want me to have, but not needs of mine. They're things I need only if I am being compelled to fit in with everypony else. You have seen me, met me... and now that you have decided you liked me, you want to change me into something else. Let me be what I am, and do not seek to change me. You barely know me as it is, and you already want me to become someone else. I have watched ponies who have changed before, or been changed. Yes, it happens.... and the first thing these new personalities do? They leave behind the remains of their past life. You might change me, but you'd also lose me.